I was one of a thousand people who descended upon Daley Plaza on Saturday night to attend Chicago’s inaugural Dîner en Blanc — a Paris-inspired dining experience that combines fine dining with a public location. Everything, including tables, chairs, and food is brought to the event, and everything, including trash, is packed out. Me and my fellow picnic-goers, dressed to the hilt in white finery, gathered at “harmonization points” throughout the city where we were then led to our final, secret destination. It was the classiest picnic I’ve ever attended. 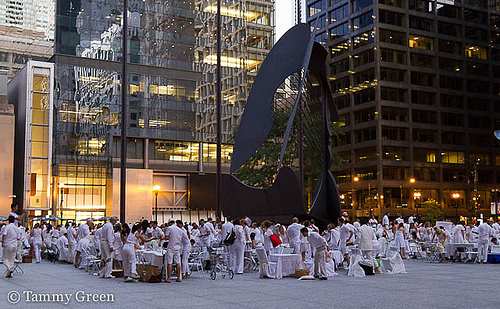 By 7:30, everyone had arrived Daley Plaza and began to set up tables and chairs draped in white. Many people brought flowers, candelabra, china, and more than a few brought lamps and antique milk glass to adorn tables. Picnics were unpacked while we became acquainted with our neighbors. A strolling musician gave downtown Chicago a Parisian air with accordion tunes from Amélie. When the United Methodist Church clock chimed 8 p.m., we simultaneously cheered and spun our white linen napkins overhead. Dinner was served. If you’re curious, my table had goat-cheese stuffed peppadews, deviled eggs, pasta salad, and a dessert of angel-food cake topped with white chocolate, raspberries and whipped cream. Whether people brought caviar or peanut butter and jelly sandwiches, everyone agreed the food tasted better because were in Chicago sharing one of the most fabulous yet strange communal dining events the city has ever seen. As we finished eating, a band struck up jazz standards and couples danced on the plaza. Some posed for photos on the Picasso, walked around meeting fellow diners, and one table even lit sparklers in celebration. And just as easily as we gathered, we packed up and drifted into the night, past our harmonization points towards home, leaving no trace of our spontaneous picnic on one of the most iconic spots in the city. 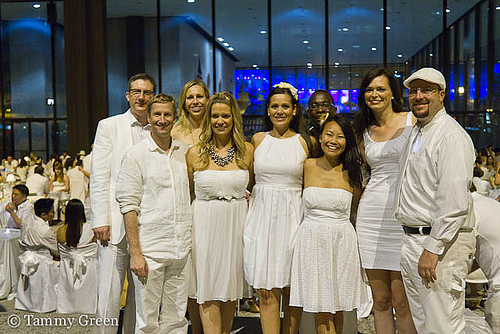 Congratulations to Chicago’s Dîner en Blanc founders on a successful event. I look forward to next year’s soirée. 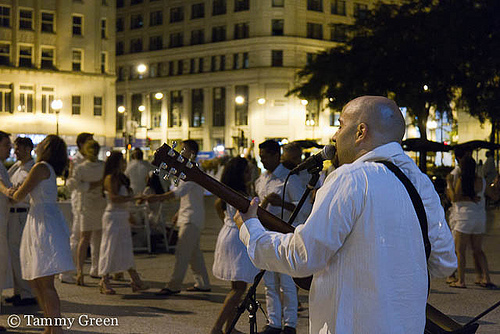 Dancing at Daley Plaza in white finery. This entry was posted in Dining and tagged Daley Plaza, Dîner en Blanc. Bookmark the permalink.